Represents a variable template specialization, which refers to a variable template with a given set of template arguments. 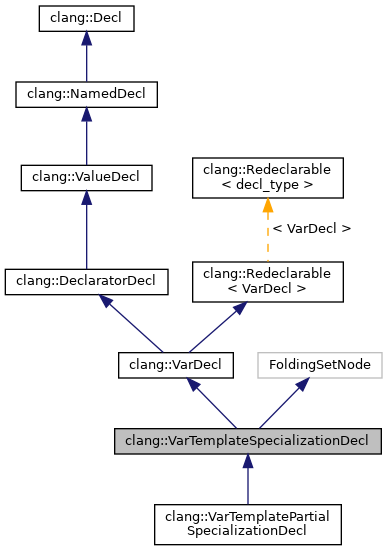 Variable template specializations represent both explicit specializations of variable templates, as in the example below, and implicit instantiations of variable templates. Definition at line 2474 of file DeclTemplate.h. Definition at line 1050 of file DeclTemplate.cpp. Definition at line 1060 of file DeclTemplate.cpp. Definition at line 2722 of file DeclTemplate.h. Definition at line 2724 of file DeclTemplate.h. Definition at line 1066 of file DeclTemplate.cpp. Definition at line 1076 of file DeclTemplate.cpp. Definition at line 2687 of file DeclTemplate.h. If this variable template specialization is an instantiation of a template (rather than an explicit specialization), return the variable template or variable template partial specialization from which it was instantiated. Definition at line 2613 of file DeclTemplate.h. Definition at line 2555 of file DeclTemplate.h. Definition at line 1081 of file DeclTemplate.cpp. Definition at line 2597 of file DeclTemplate.h. Referenced by clang::ASTDeclWriter::VisitVarTemplateSpecializationDecl(), and clang::ASTNodeImporter::VisitVarTemplateSpecializationDecl(). Definition at line 2576 of file DeclTemplate.h. Referenced by clang::Sema::ActOnVarTemplateSpecialization(), clang::ASTDeclWriter::VisitVarTemplateSpecializationDecl(), and clang::ASTNodeImporter::VisitVarTemplateSpecializationDecl(). Definition at line 1095 of file DeclTemplate.cpp. Referenced by getExplicitVisibilityAux(), getExternalLinkageFor(), clang::Sema::getMoreSpecializedPartialSpecialization(), clang::Sema::InstantiateVariableDefinition(), clang::Sema::isMoreSpecializedThanPrimary(), shouldConsiderTemplateVisibility(), clang::ASTDeclWriter::VisitVarTemplateSpecializationDecl(), clang::ASTNodeImporter::VisitVarTemplateSpecializationDecl(), and clang::TemplateDeclInstantiator::VisitVarTemplateSpecializationDecl(). Retrieve the variable template or variable template partial specialization which was specialized by this. Definition at line 2624 of file DeclTemplate.h. Referenced by clang::Sema::getTemplateInstantiationArgs(), clang::Sema::InstantiateVariableDefinition(), and clang::ASTDeclWriter::VisitVarTemplateSpecializationDecl(). Definition at line 2565 of file DeclTemplate.h. Referenced by clang::Sema::DeduceTemplateArguments(), getNameForDiagnostic(), shouldConsiderTemplateVisibility(), clang::ASTDeclWriter::VisitVarTemplateSpecializationDecl(), clang::ASTNodeTraverser< Derived, NodeDelegateType >::VisitVarTemplateSpecializationDecl(), and clang::ASTNodeImporter::VisitVarTemplateSpecializationDecl(). Definition at line 2570 of file DeclTemplate.h. Referenced by DoMarkVarDeclReferenced(), clang::Sema::InstantiateVariableDefinition(), clang::ASTNodeImporter::VisitVarTemplateSpecializationDecl(), and clang::TemplateDeclInstantiator::VisitVarTemplateSpecializationDecl(). Retrieve the set of template arguments that should be used to instantiate the initializer of the variable template or variable template partial specialization from which this variable template specialization was instantiated. For a variable template specialization instantiated from the primary template, this function will return the same template arguments as getTemplateArgs(). For a variable template specialization instantiated from a variable template partial specialization, this function will the return deduced template arguments for the variable template partial specialization itself. Definition at line 2643 of file DeclTemplate.h. Definition at line 2706 of file DeclTemplate.h. Definition at line 2682 of file DeclTemplate.h. Definition at line 2587 of file DeclTemplate.h. Definition at line 2580 of file DeclTemplate.h. Definition at line 2710 of file DeclTemplate.h. Definition at line 2714 of file DeclTemplate.h. Definition at line 2606 of file DeclTemplate.h. Definition at line 2692 of file DeclTemplate.h. Note that this variable template specialization is actually an instantiation of the given variable template partial specialization whose template arguments have been deduced. Definition at line 2654 of file DeclTemplate.h. Note that this variable template specialization is an instantiation of the given variable template. Definition at line 2666 of file DeclTemplate.h. Definition at line 2601 of file DeclTemplate.h. Definition at line 2592 of file DeclTemplate.h. Definition at line 1102 of file DeclTemplate.cpp. References clang::TemplateArgumentListInfo::addArgument(), clang::TemplateArgumentListInfo::arguments(), clang::TemplateArgumentListInfo::getLAngleLoc(), clang::TemplateArgumentListInfo::getRAngleLoc(), clang::TemplateArgumentListInfo::setLAngleLoc(), and clang::TemplateArgumentListInfo::setRAngleLoc(). Definition at line 2699 of file DeclTemplate.h. Definition at line 2674 of file DeclTemplate.h. Definition at line 2540 of file DeclTemplate.h. Definition at line 2541 of file DeclTemplate.h. Definition at line 2542 of file DeclTemplate.h.